telling us the Secrets of the Best-selling Sisterhood. Finally! My catch-up post is here. The main difference between real Victorian inventors and steampunk inventors–in steampunk all the inventions work. Make sure your story’s steampunk elements are intrinsic to the plot and not just set dressing. If you took them out, you shouldn’t be able to still tell the story. Showing in a prologue how a character gets their emotional wounds robs them of revealing it later and being visibly vulnerable. In a love triangle, Mr. Wrong represents a character’s outward identity. Mr. Right represents a character’s inner essence that they are afraid to reveal. The reason the hero is the romantic destiny of the heroine is because he is the only person who can see beneath her outer identity to connect to the essence beneath. Love at first sight – NO! Instant Attraction – YES! The death of the character’s outer false identity is more frightening to them than a physical death. The identity is there to keep you safe emotionally from the outside world and characters believe that it is truly who they are. The essence is who a character can become if they have the courage to transform but it’s scary to transform. Kristin Higgins told us you’ll never forget your first book just like you never forget your first love. Write down 3 reasons why you write and then keep them to pull out and lift your mood when you’re afraid or unsure of your writing. It doesn’t matter how many books they’ve published, all authors worry about writing, the next book, deadlines, plot holes, etc. It takes 10,000 hours to learn a difficult skill. Writing is difficult. Give yourself a break–you’re learning. Each book you write will be better. Your estimation of how good you are at something is often converse to reality. In other words, if you’re worried about how good your writing is, it’s probably good. Ray Bradbury’s advice: Go to the edge of the cliff and jump off. Build your wings on the way down. Whether you’ve sold a book or are worried about selling one, the best distraction is to begin writing another book. Additional highlights of my day included a wardrobe zipper malfunction (which I overcame with copious safety pins and my trusty cardigan), staying up all night to talk to other writers, and scouting out the goody room for marketing ideas. There is seriously a lot of candy in the goody room. Seriously. 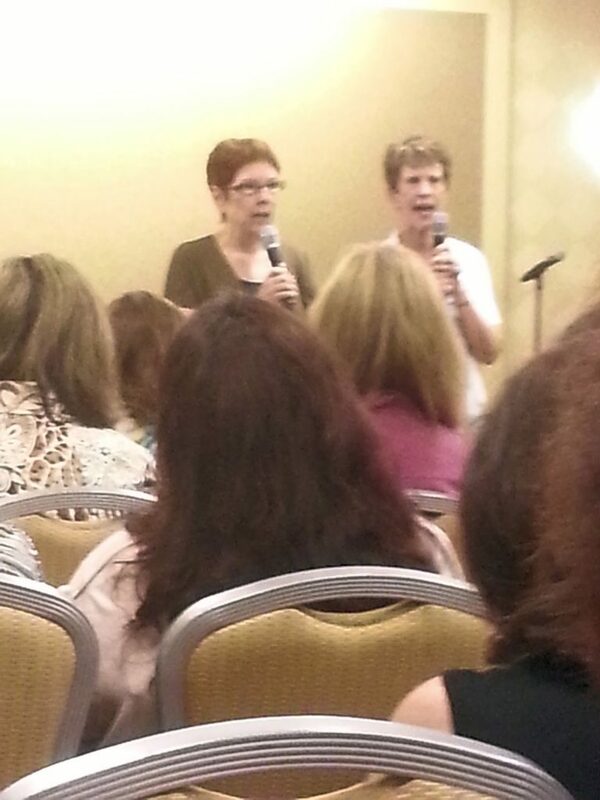 All the workshops were phenomenal, but I have to say that one of my favorites was presented by Jayne Ann Krentz and Susan Elizabeth Phillips. Not only were these ladies funny and engaging but they were also smart and full of good advice. My favorite moment came when one author in the audience stood up and asked them how they deal with the pressure of writing, worrying if it’s good, worrying if it will sell, worrying what to do if it does sell–essentially, how does she sleep at night. Susan Elizabeth Phillips simply asked the entire room for everyone that has those fears to raise their hands. EVERY SINGLE PERSON in the room raised their hand, including Susan and Jayne. It was an incredible, teaching moment for all of us newbie writers. Every writer has fears and every writer has to find a way to write past those fears. That was a powerful message and one I’m going to try my best not to ever forget.